A mountain-valley getaway in scenic Catawba Valley where Appalachian Trail and Bikecentennial/TransAmerica Trail cross between Roanoke and Blacksburg. Our 15 acres adjoined on three sides by National Park property. Rooms, porches, decks and patio designed to take advantage of commanding views in every direction. Country breakfast contains items raised on the grounds. Homeplace Restaurant nearby is like going to grandmother's to eat. Restaurants and other attractions 30 minutes or less in Roanoke, Salem, Blacksburg and Christiansburg. 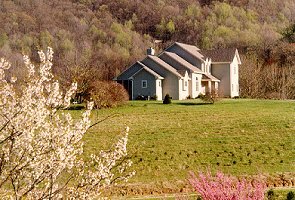 The Bed and Breakfast is within 30 minutes of Virginia Tech, Roanoke College and Hollins College. 10 miles off Interstate 81. Rooms in the main house and a loft bedroom in the carriage house all have private bath queen-size beds and air conditioning. Rates are $80 for main house, $85 for carriage house, double occupancy and breakfast at the hour of your choice is included. Hiking, biking, hot tub, catch-and-release fly fishing, crosscountry skiing.